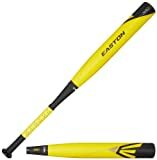 Pros: The XL1 is one of Easton’s most popular youth bats for good reason – it lives up to its reputation for being able to fire rockets while feeling effortless. Nearly every single owner of this bat will agree that the XL1 has an insane amount of pop. Cons: It would be recommended to always wear gloves when swinging this bat – it is known to sting if hit outside of the sweet spot. (Good thing the sweet spot is huge!) Also some users have voiced a concern about durability, with some even saying that it starts to lose its pop after a couple years of normal to heavy use. Easton has one goal in mind: Create the best bat possible for each and every player. With that in mind, their engineers have come up with the versatile YB14X1 XL1. Despite being lightweight, it packs a huge punch. The 2014 XL1’s smaller length-to-weight ratio, combined with a the extra-length of the barrel with a grand sweet spot and a slight-end load helps hitters drive the ball longer by taking advantage of the batter’s strength. The amount of pop makes this a great bat for all youth players, however the stronger players will see a huge improvement over lesser quality bats. For the big hitter, this bat is a must. It feels well-made and durable, and has awesome pop. Even when the hitter misses the pitch, the massive sweet spot is there to provide insurance. Beware of missing the sweet spot and hitting the ball at the end of the bat, which will definitely be felt in the form of a nasty sting. When the ball connects though, it really takes off like a rocket. The long barrel absorbs much of the energy which makes this bat feel amazing when hitting the sweet spot, which is very large. The grip makes the XL1 easy to handle for the bigger kids who are trying to drive the ball for power. Despite the weight though, it is a very balanced bat, which gives the player a lot of control. The XL1, along with their flagship MAKO bat are among Easton’s most popular and highest quality bats. They are nearly identical in that they both have extended barrels and have two-piece composite construction, however the main difference is that the XL1 is slightly end-loaded while the MAKO is balanced. This means that the XL1 could take some getting used to for a player who is used to balanced bats, but with a little practice and a strong swing, the bat will do more of the work and will really send the ball flying. Easton’s 2014 XL1 is an all-around great youth baseball bat. The price is over the $200 mark; however I still believe the bat to be a great value. This is because the XL1 is just one of those cases where you get what you pay for. Sure it may seem a bit pricey, but this bat is made for the serious player and really has the power to take a youth player’s swing to the next level. If the price point is a bit high for you, by all means you can find a good bat for a lot less. If you’re looking for performance above all though, the 2014 XL1 may have the power to take a player’s swing to the next level. The Easton XL1 is highly recommended and is a bat that I have a lot of first-hand experience with. This bat has become so popular on my son’s team that nearly half of the parents went out and bought it for their kids! There has been some occasional vibration and stinging, which we combat with a batting glove. The price of the YB14X1 XL1 is in the mid-$200 range, which makes it somewhat pricey, however is a fantastic option if you’re ready for a serious bat or looking for a secret weapon – even if you’re not a big fan of its unmistakable yellow color!